A topic that keeps coming up in iOS development is the use of Singletons. I had thought that I had written about these awhile back, but now realize that I covered these in the Testing Singletons chapter of the Unit Testing iOS Applications with Xcode 4 lynda.com course, but not written about them here. The mention of Xcode 4 probably keeps folks from watching this video, now that Xcode 5 is out. So I’m going to repeat some of what was said, but encourage you to watch the video anyways. Much of what is covered in that course is still very relevant. Unrestrained, and used without discipline, Singletons can be evil. Apple uses them a lot, so it’s easy to see why developers would think that it is perfectly ok to use them a lot also. I’m not going to get into the dangers of using Singletons, other than to point out that they are essentially just global variables. There are plenty of resources available describing the reasons to be wary of using global variables, so I won’t belabor the point here. What I will address here is the difficulty of testing them. Singletons break one of the assumptions made when using the standard pattern of Arrange-Act-Assert. The Arrange step assumes a clean starting point for every test. Each test should be completely independent of every other test. But by design, singletons retain state. In the case of unit tests, this means that one test can leave state altered that might affect another test, and that’s not good. A pattern that can be used to make singletons more easily testable is called Singleton By Choice. In this pattern, singletons can be created and used as described by the singleton design pattern, but without forcing the use of singleton behavior upon the tests. By design, Singletons are intended to be accessed using the sharedInstance class method, or sometimes a similarly named class method like shareManager. But what happens if the Singleton class is created using the usual alloc init approach? (eg. [[MySingleton alloc] init]). In Objective-C, it is common to see Singletons implemented in a manner that prevents making this mistake. This is done by overriding allocWithZone or init and redirecting back to the sharedInstance class method. Before doing that though, stop and think about why you are doing it. While well intentioned, this type of behavior not only runs contrary to the TDD approach, it in fact makes it difficult to write unit tests. The assumption is that “some other programmer is going to mistake this singleton for a normal object, so let’s fix this potential future error by silently redirecting the wrong method call to the right one”. I’m the only programmer that will work on this code that knows what I’m doing, so I better fix the other programmer’s mistakes now, while I can. In a TDD world, we really don’t need to write code that is this defensive. It’s actually kind of offensive, pun intended. Go ahead and create a singleton when appropriate, use the sharedInstance method in all your product code, and use [[mySingleton alloc] init] in your unit tests to get a fresh copy to test. //  This class provides basic Singleton By Choice functionality. //  It is intended for use as a parent class for singletons. I recently came across a 10 year old article titled “Mock Roles, not Objects“. I recall reading this article at some time in the past, but I guess that I really didn’t get it the first time. This article is awesome, and I recommend reading it. But maybe like me, you need to become fairly familiar with TDD and using mock objects before it will have much impact on your thinking. Wow. The article then goes on to explain how the proper use of Need-Driven Development can help in the creation of good, clean architecture. I think that maybe the first time I read this article, I was still stuck in creating relatively few, large objects with lots of methods. After repeated viewings of Uncle Bob’s videos though, I changed my mindset to using lots of small, SRP compliant objects. Without that mindset, it might be possible to misinterpret this article as recommending the use of partial mocks to intercept calls from one method to another within the same object. Been there, done that, got help and am hopefully on the road to recovery now. I think that there are still parts of this article that I’m not evolved enough yet to fully grok, for example section 4.1. I think I’ll come back and reread the article in another year or so and see if I get it then. How is everybody liking XCTest? Ok, Xcode 5 and XCTest have been out for awhile now. What has been your experience with it? I’ve used it for some simple projects, doing TDD with it. I’ll have more to say about that in the near future. But I have to say that I really like the tighter integration of unit testing into Xcode. One of my favorite things is the speed at which I can perform the TDD loop. This has been boosted by a couple things: the test classes assistant, and the ability now to rerun a single test by clicking on the symbol next to the line number (red “x” for a failing test, green checkmark for a passing test). In the screen capture below, I’m using the test classes assistant to display the associated unit test case file on the right. I’ve just run tests, and the test at line 37 on the right failed, and is highlighted. Note that the other tests have a green checkmark next to them. Although you can’t tell from this screen capture, I’m hovering the mouse over the red checkmark left of the line number at line 37, which has caused the checkmark to switch to a right arrow. Clicking on this reruns just that test. How cool is that! At this point the only work around is to run the iOS 7 simulator. We generally do not use Storyboards in our projects where I work. That’s mainly because, at least as of iOS 6, they cannot be merged. This means that only a single developer can make changes to a storyboard at any given time. However, it appears that Apple is working on correcting this situation. So I’ve been taking another look at Storyboards, and investigating how these can be integrated into our best practices (TDD, clean code and architecture). You’ll need to set the identifier for the view controller in the storyboard, and then modify the code above to match the name of your storyboard and the id you chose for the view controller. The second question is how to integrate storyboards into the VIPER architecture. First off, it seems that the storyboard should replace the wireframe component. But there’s a problem. Normally the wireframe would be responsible for creating the view controller, interactor, and presenter. But the storyboard only creates a view controller. Now, we can easily have the view controller’s viewDidLoad method create the interactor and presenter, but that results in making the view controller aware of those components. From a clean architecture perspective, we’d prefer that these components remain as detached from each other as possible. That said, I don’t know how the storyboard can be used to create all three components, so I guess we’re stuck with the viewDidLoad hack at this point. I’m continuing to investigate, and I’d love to hear your suggestions. This past week I helped out one of our large project teams to knock down their bug backlog. This was code that I hadn’t really worked with before. It was delightful to work with a state of the art, new code base that fully utilized great architecture (VIPER), Uncle Bob’s clean code practices, extensive unit test coverage using Kiwi and OCUnit, and automated UI tests using KIF. Understanding the code was easy, and locating the correct spot in the code needing changes was very straight forward, a result of both good architecture and clean coding. I was even more delighted to find that the code needing changes was covered with Kiwi tests. I absolutely love working with Kiwi (debugging difficulties aside). It is so incredibly flexible, just about any type of testing can be accommodated (ATDD, BDD, TDD). I still have a lot of room for improvement in my skills at combining all of these though, and am hoping to take my skills in using it to higher levels. This is just a rough draft of code, and probably syntactically incorrect. I’m going to build some tests using this approach, and will clean up the syntax and provide some more detail as I work it out. For example, readability is better without beforeEach/All (and left out above), so I want to see which happens if code is inserted without one of these (I’m hoping the same as beforeAll). My first attempt at converting a real project to XCTest in Xcode 5 went fairly well. The project was fairly simple, and had 582 OCUnit Application tests using OCHamcrest assertions. I performed this using Xcode 5 DP3, so the issues I encountered should have been fixed by the time you read this. Xcode 5 supports both OCUnit and XCTest, so the app loaded and the tests ran ok. Interestingly, the Test Navigator displayed all of the OCUnit tests nicely. I had wondered whether or not the Test Navigator only worked with XCTests. It works with both though. Once all the tests were passing, I then used the “Edit -> Refactor -> Convert to XCTest” menu option to convert the OCUnit test target to XCTest. I wasn’t sure what was going to happen, but had Git ready to undo any changes if/when things got messed up. It turned out that I didn’t need to do this. The conversion worked almost perfectly. This isn’t a tough operation, basically just changing the #import from SenTestingKit to XCTest, and changing the test case class parent from SenTestCase to XCTestCase. This conversion reused the same target, without renaming it. So things look pretty much the same in the Test Navigator before and after the conversion. Then I tried to run the tests. I expected that the tests would fail, or maybe even fail to compile due to OCHamcrest. What happened though was that Xcode 5 crashed. However, upon restarting Xcode 5, I could then select to run the tests without crashing, but got a linker error. The conversion operation did not add the XCTest framework to the converted target. It did remove the SenTestingKit framework though. So this is probably just a bug in DP3. I submitted radar 14470998 which is fixed in the latest code. After adding XCTest to the test target’s link build step, all tests ran and passed! I have wondered, and talked with other developers that I work with, about why Apple would simply rename SenTestingKit to XCTest. It doesn’t appear that much if anything is functionally different. I’ve come to the conclusion (and the hope) that this is just the beginning. Having a totally separate, new framework allows Apple to make changes and additions going forward, without worrying about breaking legacy SenTestingKit users. Let’s hope that this is a new start for unit testing support from Apple. Xcode 5 is going to provide significant enhancements for unit testing. 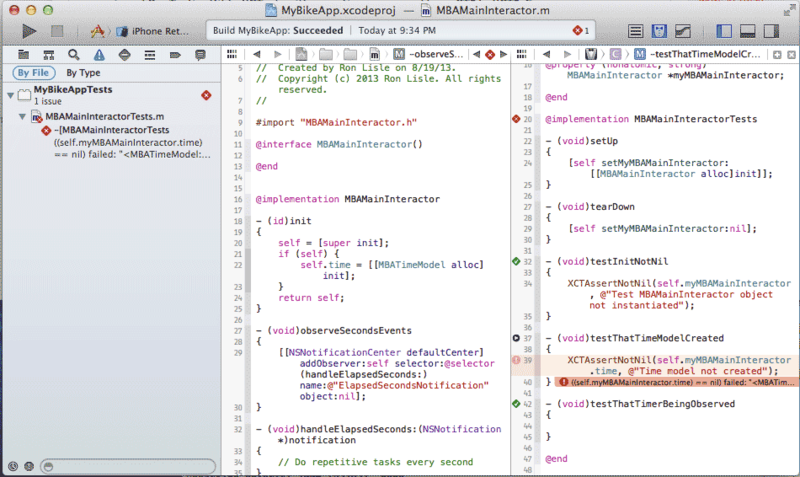 I recommend that you check out the WWDC 2013 videos “What’s New in Xcode 5” and “Testing in Xcode 5”.